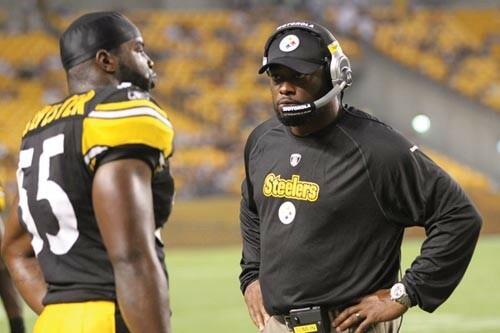 Head Coach Mike Tomlin's "matter-of-fact" style has been good for the Steelers. If a tree falls in a forest during an NFL lockout, does anyone hear it? If not, then Rashard Mendenhall, James Harrison and Hines Ward -- who may have behaved in a way unbefitting of the standard of the Pittsburgh Steelers this past off-season -- are in the clear. Not to rationalize, but at the rate the NFL is creating multi-millionaires and larger-than-life egos, it's becoming harder and harder to produce exemplary football citizens these days, especially those worthy of wearing the black and gold. Fortunately, the Steelers' on-field activities are supervised under the close eye -- actually two very intense eyes that sometimes look like they might pop out of their sockets -- of head coach Mike Tomlin. Entering his fifth full season in Pittsburgh, Tomlin has won a Super Bowl (the youngest head coach ever to do so); graciously lost another; and captured the hearts of one of the most devout/skeptical/obsessed fanbases in all of sports. In the age of Wi-Fi, reality television and cameras attached to nearly everything with an "on" switch, he also has done it discreetly, maintaining a low profile off the gridiron. Aside from occasional bursts of unrestrained emotion, like he showed last year when pumping up the faithful at Heinz Field following the AFC Championship, Tomlin is the definition of "matter of fact." That's probably why one of his favorite sayings is: The standard is the standard. But here's what we know about Tomlin: He's a church-going, married father of three; occasionally shows up at Penguins' games; annually hosts a charity tailgate event in his home state of Virginia; isn't afraid to wear long-sleeve, black shirts in the heat of training camp; and utterly wowed the pants off the Rooney family when interviewing for the Steelers' coaching vacancy in 2007. Another one of Tomlin's accomplishments -- possibly his greatest yet -- has been limiting the number of times the names "Noll" and "Cowher" are mentioned by Steelers faithful. Talk about having big shoes to fill … both Andre The Giant-sized pairs of them! When the Rooneys gave Tomlin the keys to the family mansion, he was expected to win immediately; he was only a year off. When ingrates claimed Tomlin won the Super Bowl with Bill Cowher's squad, he stayed the course during a bumpy 2009 season and returned to the title game a year later. Those same ingrates will now tell you that the Steelers have one of the best coaches in football. So will many of the players themselves. In a 2010 Sports Illustrated poll, NFL players were asked which coach, other than their own, they would like to play for. Tomlin was second on the list. In many ways, coaching an NFL team in 2011 is like trying to ride a skateboard while holding two hand grenades. It requires a delicate balance of grace, grit and goofiness -- being Dr. Drew, General Patton and Zach Galifianakis all at the same time. If Chuck Noll coached today, would he be able to hug it out with Terry Bradshaw following a batch of thoughtless Twitter posts? Tomlin has effectively been able to combine old school with new age. During the buildup to Super Bowl XLIII, he not only preached the importance of discipline and character, but revealed his silly side by urging his players to dream about holding the "sticky" Lombardi Trophy, one that would be covered in kisses, dirt and smudges once everyone got their grimy mitts on it. As the 2011 NFL season nears, you'd be hard-pressed to find many in Pittsburgh who don't think Tomlin is the perfect Steelers coach, a conclusion the Rooney family reached four years ago. The standard is the standard for a reason.